Innovative newspaper ads are a rare beast. We've seen a few fun ones lately—the Game of Thrones ad with the dragon shadow; the ad for the movie The Book Thief with two almost completely blank pages. Here's an interesting one from Colombia. 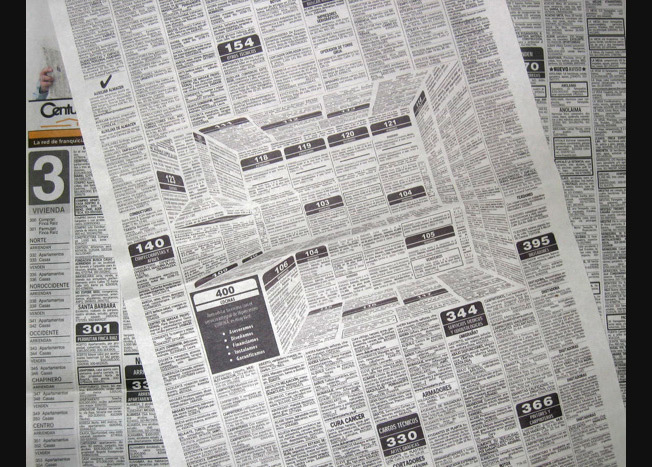 It's an ad for kitchens hidden inside a fake classifieds page—thanks to a nifty 3-D effect applied to the text. "The kitchen you are imagining is in HiperCentro Corona," says the headline. You can argue about how effective it might be. Is it too subtle? But it's conceptually strong (it's a great way to illustrate something that could be on your mind while idly reading a newspaper) and executed well, too. Plus, here we are talking about a newspaper ad from Colombia. How often does that happen? Sancho BBDO copywriter Felipe Salazar posted the ad to his Behance page.